November | 2011 | Save the Kales! 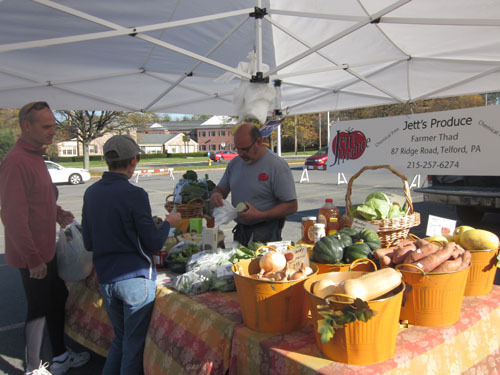 BETHLEHEM GROCERY FOOD CO-OP THIS WEDNESDAY! So, so exciting. In case you missed my post that explains the heart (and dare I say, community-based soul?) 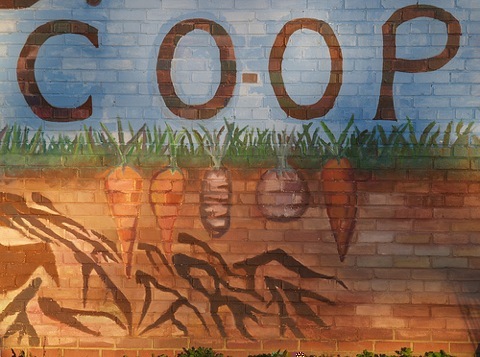 of a what a Food Co-op actually is, please read this. I’m happy to say the first meeting got some press in one of the local papers today as the Express Times ran an article about the idea and the meeting, as well. This is important because this is going to be a lot of work. The fact that we are going to need a lot of volunteers, staff, lawyers, accountants, folks with experience, etc… is not lost on us and the more we spread the word, the more we can find those people. So keep telling everyone! This Wednesday meeting is also a vegetarian/vegan potluck. You don’t have to bring food, but if you feel inclined, please do! Everyone is always happier then they are eating. Pair that with community involvement and the Library might start to shoot out actual beacons of light this Wednesday. Read the Express Times article HERE. I hope to see you Wednesday, Dec. 1st, at the Bethlehem Public Library (Northside location), between 7pm-9pm! Colleen Patrick Goudreau talks at Vegetarian Summerfest about Holiday Traditions and Thanksgiving ideas and ideals, and “the human ability to cling blindly to one’s rituals” – with an analogy drawn from Shirley Jackson’s The Lottery. Last week I uploaded my photos from Ithaca, the GreenStar food Co-op, and other food in general… only to discover my photo editing software completely disappeared from my computer and I’m kind of stuck with oversize files that WordPress doesn’t like. I’m trying to figure it out (and by that I mean use my Harriet the Spy sleuth powers to try and find it? Where did it GO!?). In the meantime, if anyone has suggestions for Mac compatible software that isn’t like 45 million dollars, please let me know. Sheesh! ***Funny note: At first I typed “Harriest the Spy”. But if you’ve ever seen my hair, you will agree that’s probably accurate. 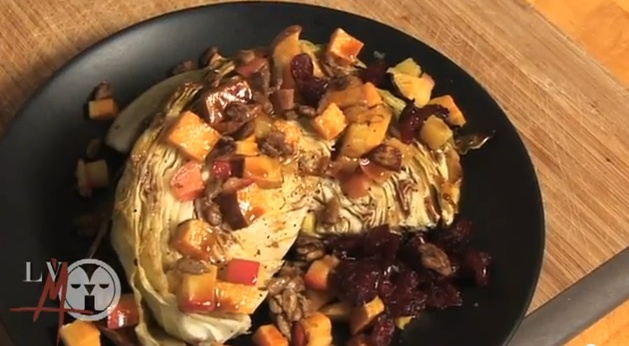 NEW VIDEO: Hot Cabbage “Wedge Salad”; Fall Flavors! Thanks once again to Lehigh Valley Mirror for your video producing and editing prowess! This dish was influenced by the nutritional abomination called a wedge salad. This usually consists of: a chunk of iceberg lettuce covered in bacon and bleu cheese. Not vegan. Not healthy. Usually (strangely enough) kind of expensive in some fancier restaurants. Who needs that? Here I took the concept of shape and texture and created a plant-based whole foods warm dish with sweet and savory flavors. This is very simple prep work and cooking for a pretty final result. vegan butter melted in a pan (Earth Balance! ), about 2 Tbsp. Manatees LOVE cabbage! Invite some over for Thanksgiving! Heat the oven to 400 degrees. Spray a baking sheet with cooking spray. Place the cabbage wedges on the sheet, then lightly brush with olive oil. Season with salt and pepper. Roast in the oven until starting to brown, about 25 minutes. To make the dressing, whisk the mustard, balsamic vinegar and maple syrup together in a small bowl. For the candied nuts, melt the vegan butter in a pan on low heat. Add brown sugar and mix until it’s thick and caramelized. Add nuts and stir to coat – add more nuts if mixture is still really wet. Add a dash of cinnamon, and spread mixture out on a sheet of wax or parchment paper to cool. When all components are ready, plate by putting the cabbage on the bottom then topped with the apple and yam mix. Then drizzle on some dressing, top with the candied nuts and add some dried cranberries for a garnish! There you go! This makes an awful lot of food, and would be a great addition to a Holiday meal or potluck. Enjoy! New Post + Video Coming Tomorrow! Sickness and busyness and traveling. 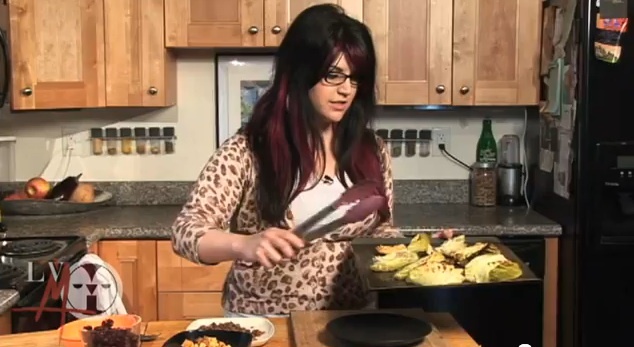 Check back tomorrow for a new video with LV Mirror for a pretty Thanksgiving dish! 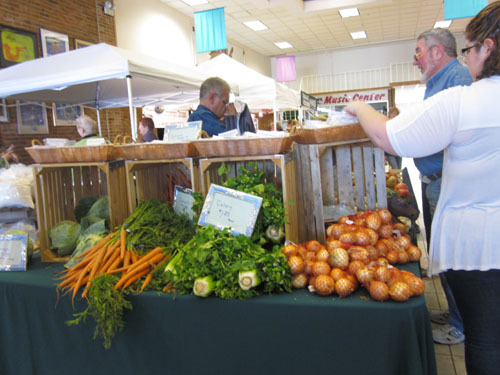 YEAR-ROUND WEEKLY FARMERS MARKET IN BETHLEHEM: New! Indoors in Winter Months! In the Most Unlikely of Places! So when you take the wonderous oasis that is a Farmer’s Market and find a way to make it a year-round event, noteably even during freezing Pennsylvania winters, everyone benefits. But here’s the punchline to… well, not to a joke, exactly, but it doesn’t seem to fit at all: This is happening in the Westgate Mall on Schoenersville Road. The Westgate Mall, in short, can be summed by up watching the viral video of David at the Dentist – Is this real life? That said, I think everyone, even wacky abandoned strip malls, deserves a chance to explore a fresh start and a newly improved identity. So! 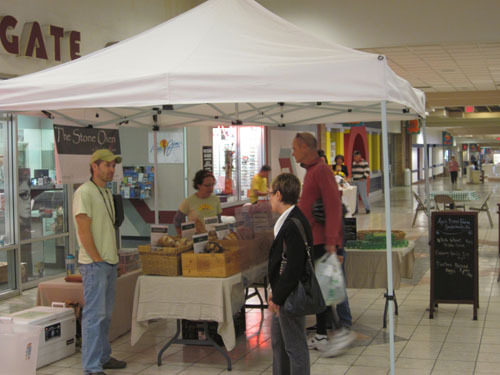 The Westgate Mall Farmer’s Market was born, and I heartily applaud whoever got it running. 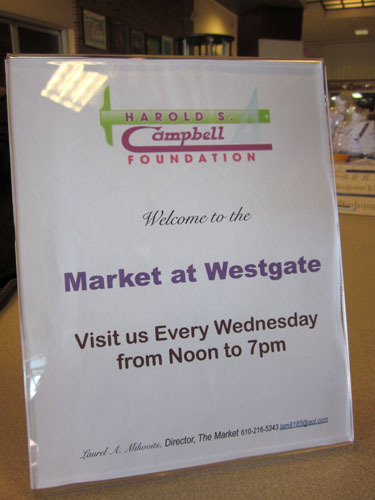 Aside from the benefits of having a Farmer’s Market, I hope this can serve to propel the Westgate Mall into better status, bring in new merchants that last longer than 2 months and offer needed businesses. Large flags wave near the road on Market days. 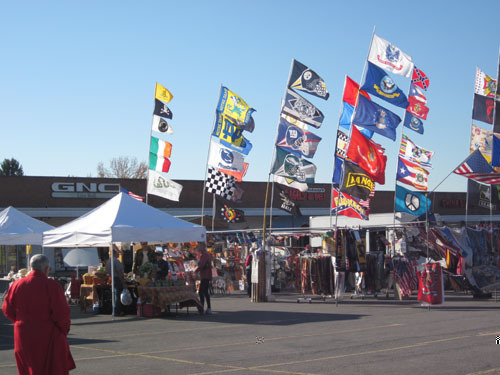 You CAN'T MISS the market because one of the vendors sells flags. Lots and lots of flags. It's weird and kitschy and alright by me. Why not? Collard greens and squash, yum. It was wonderful to meet first hand even more of the farmers and vendors that have expressed interest in our Co-op project (see two pervious posts). While yesterday was the first day and the number of vendors was low, more will be coming in as the weeks progress and it’ll be wonderful to be able to shop for local goods past November. 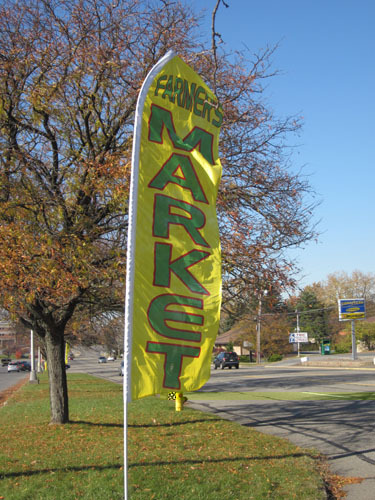 This is a really great time to kick this off as other local outdoor markets just wrapped up for the season. 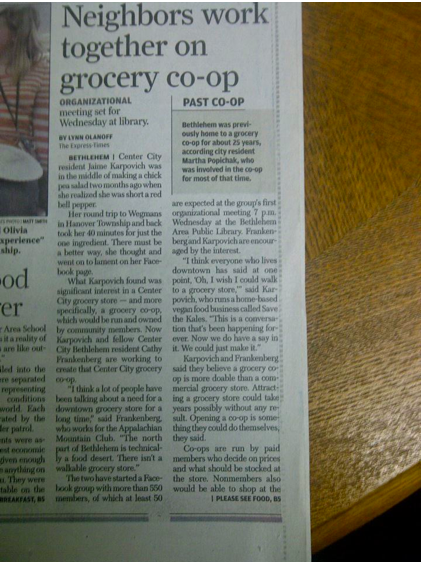 The response to the idea of having a Co-op in Bethlehem has been OVERWHELMING. To say the very least. Whether you have reached out, offered networking/advice, volunteered time or “whatever it takes!”, or simply support the idea — THANK YOU. This sounds pretty sappy but for real — we are the ones who will make this happen — and I am happy to report it’s pretty unanimous that we all WANT this to happen and make it really, really good. … And again, stay tuned as a second meeting will be planned for those unable to attend this one. EXCITING NEWS: We had planned to get a more tangible idea of the vision for the Co-op before we went to the City of Bethlehem to present the idea and ask for advice and help. BUT! They caught wind of it and contacted us first because they were excited to learn more! I just got back from an impromptu meeting with folks from the Economic and Development council who were able to answer some questions, offer insight, and say they are on board with the idea. Before I left I said, “I just have to ask, perhaps off the record, in your general opinions… do you think this could work? Is there any outstanding reason why it couldn’t?” And the short answer was: Yes it could work. No, there is no reason right now why it couldn’t. Very encouraging. Can I oreiterate that I love living here? I’ll make an update here very soon with the photos, which at the very least can get all of us excited about buying gluten-free pasta from bulk bins. Or whatever.